Herbs are a natural way to add flavor and health benefits to a meal for minimal calories and without sodium, sugar or fat. However, knowing what herbs to use when cooking can be intimidating. It can also be eye opening to learn the health benefits of herbs! I share a complete guide on “How to Use Herbs and Spices” in the Healthy Grocery Girl Nutrition Plan. However today, we’re going to chat about three… basil, parsley and cilantro! Basil, also known as Thai Basil and Sweet Basil, is best in Italian and Thai dishes. Basil goes great with these herbs: dill, parsley and mint. A great example of a dish to add fresh basil to is spaghetti! Basil has been known to help lower blood pressure and is also a source of vitamin A. Vitamin A supports healthy eyes, skin, teeth and bones and also supports a healthy immune system. Parsley is best in French, Spanish, Italian, Greek, Lebanese and Persian dishes. Parsley goes great with these herbs: mint, basil, tarragon and oregano. Add parsley to a green salad or toss with grains such as quinoa or rice. Parsley helps cleanse and detoxify the body, which can also help improve our skin. Parsley also contains flavonoids, a nutrient that helps reduce inflammation within the body as well as vitamin K. Vitamin K supports healthy blood clotting and building strong bones. Cilantro, also known as coriander, is best in Indian, Thai, Mexican, Vietnamese and Lebanese dishes. Cilantro goes great with these herbs: cumin, turmeric, mint and curry. Try adding fresh cilantro to tacos, taco salad or with rice and curry sauce! Cilantro can help lower cholesterol levels and contains vitamin C, an antioxidant that strengthens the immune system. 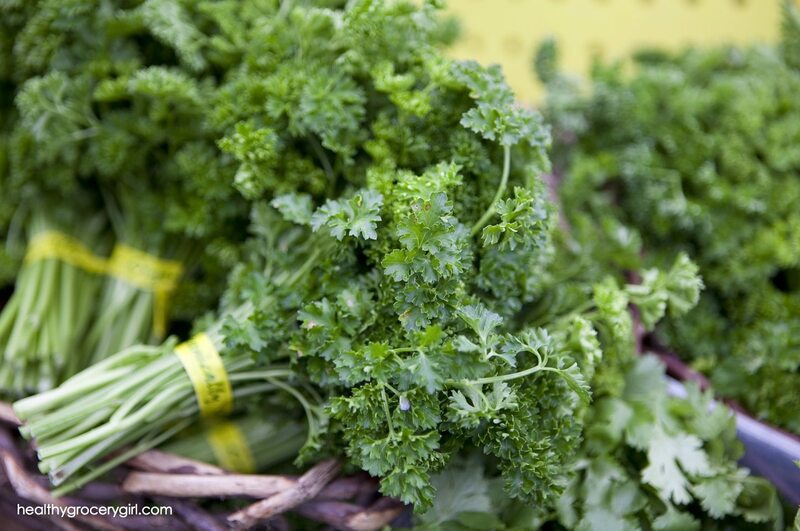 You can find fresh herbs at your local grocery store or farmers market! Fresh and dried herbs are not interchangeable in recipes. Follow this golden rule when swapping fresh for dried herbs: 1 part dried herb is equal to 3 parts fresh herb. Nutrition, health and finding healthy grocery alternatives can be overwhelming! For more information on how to shop, cook and eat healthy check out the Healthy Grocery Girl Membership!